This past weekend was practically the perfect storm for fantasy owners in keeper leagues. Not only did ballyhoo’d pitching phenom Stephen Strasburg make his encore appearance on Sunday against the Indians, but the top hitting prospect (Florida’s Mike Stanton) and the top catching prospect (Cleveland’s Carlos Santana) also enjoyed a productive first weekend in the big leagues. Every few years or so, there seems to be a huge bumper crop in top-flight rookies. 2006 had a ridiculous year that included the likes of Hanley Ramirez, Ryan Zimmerman and Justin Verlander (to name a few). There were a couple guys named Albert Pujols and Ichiro Suzuki who topped eventual interlopers like CC Sabathia, Roy Oswalt, Jimmy Rollins and Adam Dunn in 2001. 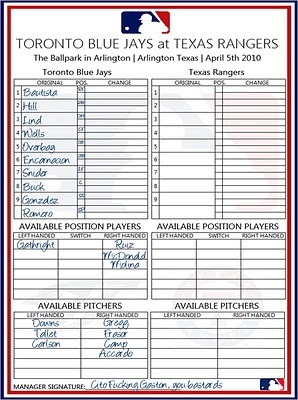 And with Jason Heyward, Buster Posey, Mike Leake, Justin Smoak and Neftali Feliz having major impacts in the game during their freshman campaigns, 2010 is looking to be very similar to ’06 and ’01. For now, though, let’s take a look at how these three uber-prospects fared this past weekend. And just a word of warning: these three players have not been in the big leagues for very long, making for small and unreliable sample sizes. The numbers may eventually prove to be accurate, but there simply is not enough Major League data to make solid guesses/estimates. Proceed with caution! As much as Indians fans may be missing Victor Martinez at the plate (though him behind it is another matter, altogether…), this kid isn’t too bad himself. While his debut wasn’t much to write home about (0-for-3 with a walk and a run scored on June 11 against the Nationals), he exploded in Game 2 by going 2-for-4 (first hit: double) with a home run, three RBIs and a run scored, then got a hit and a walk off Strasburg on Sunday. And one of the best parts about his first three games is that he has yet to strike out. In all seriousness, though, one of Santana’s better qualities is his discerning eye. 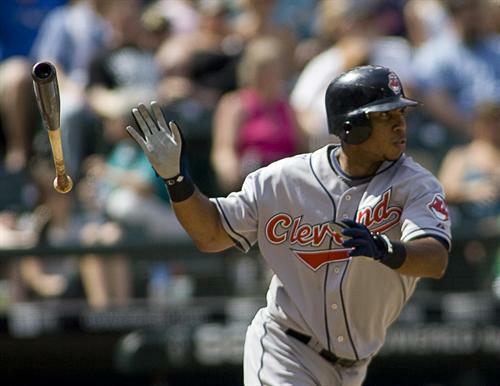 Starting in 2006, Santana’s walk rate in the Minor Leagues improved every season. His strikeout rates have been a little more mercurial, but have never topped 20 percent over a full season. This is good news for fantasy owners in leagues that value walks and/or on-base percentage because in an Indians lineup that has just Shin-Soo Choo as it’s lone legitimate threat, it would be safe to say that Santana will encounter his fair share of walks, since the 24-year-old backstop has clearly demonstrated he has power from both sides of the plate. Now three games is an awfully small sample size to judge how Santana’s skills will translate at the big league-level (a hurdle all three of the featured players will encounter), but so far, the numbers Santana is providing don’t seem to be out of line with his skill set. He’s only swung at 29.6 percent of pitches outside the strike zone (comp: Vlad Guerrero leads baseball by offering at 49.5 percent of pitches outside the zone), and when he does swing at pitches inside the zone–55 percent, BTW–he puts the bat on the ball 90.9 percent of the time, so it seems as if he’s making good decisions at the plate, so far. Does this guy have rotten timing to make a debut or what? The same day he goes 3-for-5 with two runs scored and almost gets the go-ahead hit, the guy at the end of this list not only makes his MLB debut, but decides to strike out over half-a-dozen batters in less than 100 pitches. This past weekend wasn’t that bad, either: 4-for-10 with a triple, a double, four RBIs, three walks, four strikeouts, two steals and two runs scored in three games against a tough Tampa Bay pitching staff. Stanton’s biggest flaw, though, is his propensity for strikeouts. Throughout his Minor League career, Stanton struck out 371 times in 1,392 plate appearances, which comes out to him striking out in 26.7 percent of his PAs. 2008 was especially harsh for the Marlins’ 2007 second-round draftee, when he collected 153 whiffs in 540 plate appearances (28.3 percent). Obviously, this is a big red flag because even though he will get his home runs (and they will come), all those missed swings will greatly hold back his batting average and, in turn, limit his batting average and RBI opportunities. There is plenty of hope on the horizon, though. The majority of those strikeouts came while he was just a teenager and after initially struggling in his first go-around in Double-A Jacksonville last season, Stanton made the necessary adjustments to boost his batting average from .231 to .311 at the time of his call-up. His strikeout rate fell from 99/341 (29 percent) in 2009 to 53/238 (22.3 percent), while his walk rate bumped up from 31/341 (9.1 percent) to 44/238 (18.5 percent). He also is not only an outfielder–limiting the amount of wear and tear on his body–but he is also a highly-rated defensive outfielder, too. Many scouts and analysts say that right now, Stanton projects to be a Ryan Howard-type player from the right side: a ton of power to go with a ton of strikeouts. But, if he continues to improve on his plate discipline and you add in the element of speed (he already has two steals and a triple, and is considered one of the best overall athletes in the game right now), keeper league Stanton owners may have one of the most valuable players not named Heyward. C’mon, did you honestly think I’d make it to the end of June without looking into the kid. I mean, The Associated Press only compared him to Walter Johnson after his historic start last Tuesday. Thankfully, some of the hysteria has died down a little, especially after the more realistic outing he had yesterday against the Indians. Yes, his fastball hits 100 mph and “drops” to the upper-90s late in the game. Yes, his changeup can clock in at 91 mph (somewhere, Jamie Moyer just suddenly felt sad and doesn’t know why). And yes, his curveball would probably make Bert Blyleven jealous. But just for a moment, let’s go beyond that and see how Mr. Precedent gets things done. In my hapkido (a Korean martial art) class, my master constantly preaches about how technique is “the ability to control your opponent.” Controlling his opponent is what Strasburg–and every other pitcher, for that matter–sets out to do in every at-bat, and that starts with throwing first-pitch strikes. Through two games, Strasburg pumps in a first-pitch strike 61.7 percent of the time, an astounding rate for a young power pitcher. Just to serve as frames of reference, only 30 eligible starters have higher FPS rates (Cliff Lee leads the Majors with a 71 percent mark) and names such as Sabathia, Adam Wainwright, Jered Weaver and David Price lag behind Strasburg’s mark. All these strikeouts are great, for the fans, the TV ratings and fantasy owners of Strasburg, but we all know what happens when great young arms quickly pile up the whiffs. Probably no one knows this better than Nationals manager Jim Riggleman, who, as skipper of the Cubs back in 1998, witnessed both the meteoric rise and fall of Kerry Wood within a span of 14 or so months. Riggleman told Washington Post columnist Thomas Boswell that while the strikeouts are nice, “it’s better to get three outs on 12 pitches than three strikeouts on 18 pitches.” Of course, this was said prior to Strasburg’s first start, when he had his cake and ate it, too. 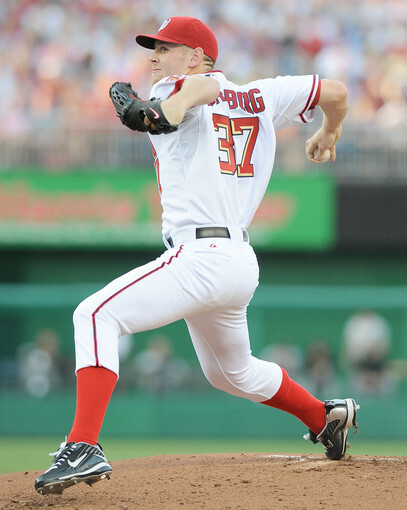 Of the 36 outs Strasburg has recorded in his big league career, 22 were via the strikeout, nine on groundouts and five on flyouts. It would be impossible to expect the San Diego State alumnus to routinely rack up double-digit strikeout games without breaking the 100-pitch barrier, so for this year and possibly next, fantasy Strasburg owners (especially keepers) should go against their nature and hope he doesn’t collect too many K’s. Simply put, Mr. Precedent won’t turn 22 until the end of July and his body isn’t yet conditioned to handle a Major League season yet. Fewer strikeouts mean fewer total pitches he uses and less stress he will put his arm under. 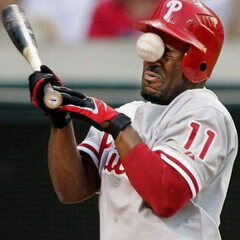 But then again, his stuff is just soooooooooo good that he doesn’t even have to try to get the strikeouts. They will just simple come. Another new addition here at The Fact of the Matter. This will list 24 players (C, 1B, 2B, 3B, SS, three OFs, DH/UTL, four SPs, two RPs, nine bench players) who I felt did the best between the previous Friday-Sunday period. I mean, this is Weekend Matters, right? But, as a caveat, I may not include players who had one really incredible day and were either mediocre or flat-out bad the other two days. If you feel anyone was egregiously left out, please, by all means, voice your concerns! C Miguel Montero returned from 15-day DL on Saturday.